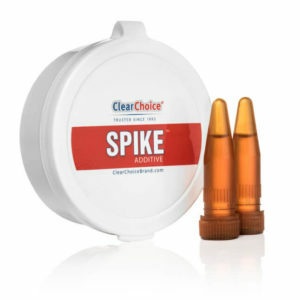 Clear Choice scientists created SPIKE™ after thousands of hours of intensive lab research. SPIKE™ is a new revolutionary breakthrough – it’s the smallest, most potent, undetectable urine purifier ever created to date. A quickly dissolving liquid that is colorless and odorless and cannot be detected once added to a urine sample.SPIKE™ was formulated for the enzyme multiplied immunoassay test (EMIT test) which is the initial screen in 99%of work places. SPIKE™ is NOT effective on the more accurate gas chromatography/mass spectrometry (GC/MS). NOTE: This product will not work for EMIT tests that have the test strip built into the collection cup. You should NOT use for GC/MS also know as the confirmation test. Using this product on a GC/MS test may lead to a positive result. ✓Light / Occasional smokers: Simply pour entire content of 1 vial into your urine sample. Each vial is effective for a sample up to 120ml (4oz). For urine samples over 120ml (4oz) you will need to use both vials at once. ✓Heavy / Daily smokers: Simply pour entire content of both vials into your urine sample. ✓Warning – using two vials can cause a slight odor, but waiting a few minutes will minimize the odor.